Screen Captures of The Age Of Adaline! 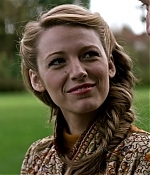 Thanks to Jessica I’ve uploaded ~ 2,000 screencaps of The Age Of Adaline! I’m really excited to be sharing them with you, so don’t forget to swing by the gallery and check them out! ‘Age Of Adaline’ Press Conference! I’ve added to the gallery 51 HQ images from ‘TheAge Of Adaline’ press conference. I must say – Blake looked absolutely breathtaking! If you don’t believe me, just pop to our image archive! 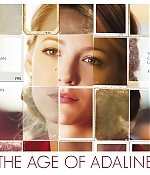 We have added x04 new stills for Blakes upcoming film The Age of Adaline, plus the UK poster, thanks (fancarpet) The movie will be released in the UK on May 8th 2015. Blake Lively suffered an injury during filming of The Age Of Adaline in Vancouver, Canada earlier this week. 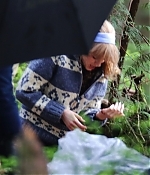 The 26-year-old was seen gasping as she discovered the bloody wound, after reportedly slipping and falling down a hill. But after inspecting her wound the actress began laughing and ever the professional, it wasn’t long until she was back to work. 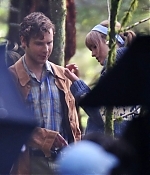 Blake, who plays the lead in the film, was wearing a blue woolly cardigan and a pale blue headband in a fifties style. She was joined on set by her co-star who didn’t look too concerned by Blake’s injury but he did come over to inspect her wound. Poor Blake! Finally some movie news! After a one year hiatus to spend time with her hubby, Blake Lively is returning to the screen in the movie The Age Of Adaline. The part, which was once earmarked for Katherine Heigl, is of an ‘ageless beauty’ born at the turn of the century, Deadline announced on Wednesday. Last month the Gucci model told Vogue UK, ‘There’s a movie I’m really excited about… and one of the most enticing parts of it is that it spans from the 1900s until now.’The fashion is amazing, and my character gets to experience all of the different time periods and tell the story through fashion.’It’s not a movie about fashion, but it’s an integral part of who she is and the whole story.’ Ellen Burstyn co-stars and cameras start rolling in March. Deadline reports Blake’s character stops aging at 29 when she’s in a near fatal accident. ‘Over the 20th century she embarks on an epic but isolated worldwide journey, keeping her secret, until she meets a man who forever alters her life,’ Michael Fleming Jr. reports for the site. ‘We searched for the ideal director and stars. We believe that we have found them with Lee Toland Krieger, Blake and Ellen, and together they will tell the story of Adaline in a way that audiences won’t forget,’ studio chairs Rob Friedman and Patrick Wachsberger. who are overseeing the film, told Deadline. Katherine Heigl, who The Hollywood Reporter slammed last month for her ‘bad behavior,’ may have dropped out of Adaline to start a new TV series. Blake was spotted this week touching down with her husband at an airport in New Orleans, Louisiana. That’s where Ryan is filming Selfless, about a wealthy old man who transforms his consciousness into the body of a much younger man who has a past full of secrets.